From September 3 to 5, I will be attending STI 2014, the 19th International Conference on Science and Technology Indicators. 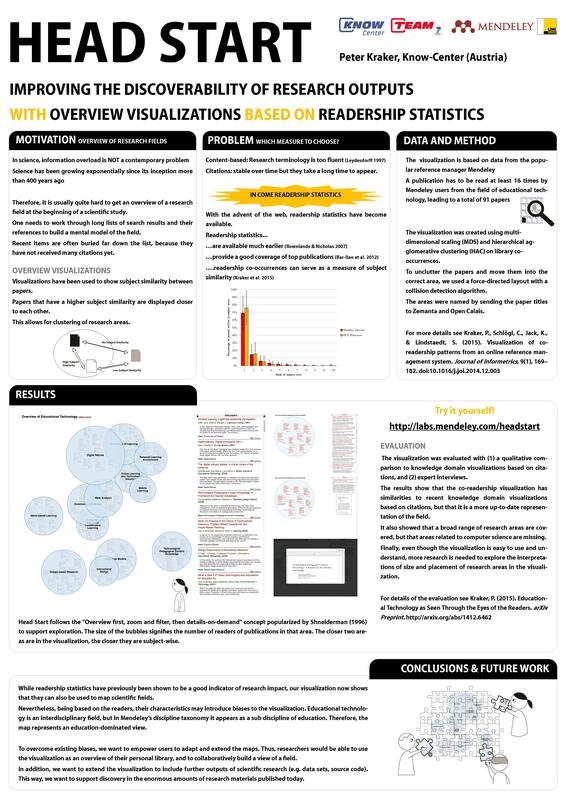 There, I will present a paper entitled “Altmetrics-based Visualizations Depicting the Evolution of a Knowledge Domain” that I co-authored with Philipp Weißensteiner and Peter Brusilovsky (download the PDF here). In this work-in-progress paper, we present an approach to visualizing the topical evolution of a scientific conference over time. 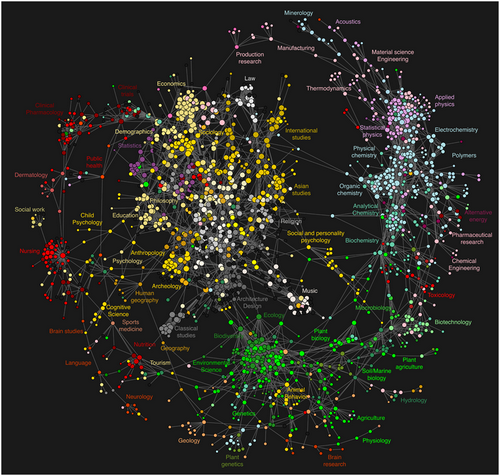 Below you can see the results: a topical overview of the 19th and 20th iteration of UMAP, representing the conference years of 2011 and 2012, as well as the evolution of the domain.An interactive prototype can be found on http://stellar.know-center.tugraz.at/umap/. The data source for these visualization is quite unique: it is the conference scheduling system Conference Navigator 3 (CN3). CN3 allows conference attendees to create a personal schedule by bookmarking talks from the program that they intend to follow. And it is exactly this scheduling data that we have employed to create the above visualizations: we used co-bookmarking as a measure of subject similarity, meaning that two documents are related when they are bookmarked by the same user in the system (see example to the right). The more often two documents are bookmarked together, the more similar they are subject-wise. On top of this co-bookmarking data, we performed the knowledge domain visualization process from the open source visualization Head Start to create individual representations of the field (please refer to the paper for details). This resulted in the first two visualizations pictured earlier on. 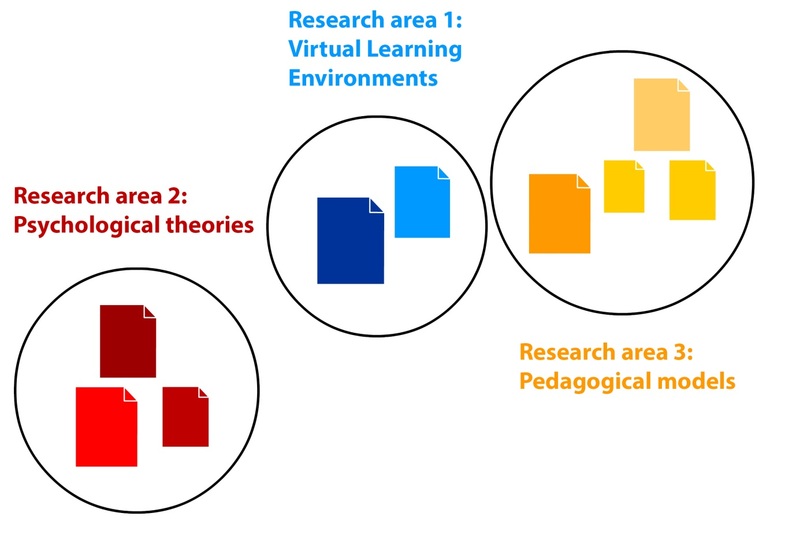 The blue bubbles represent research areas. 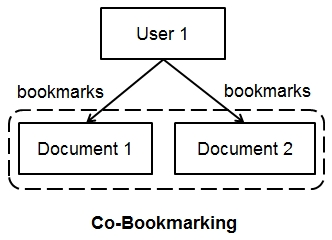 The size of an area is determined by number of bookmarks that the papers related to this area have received. Spatial closeness implies topical similarities. 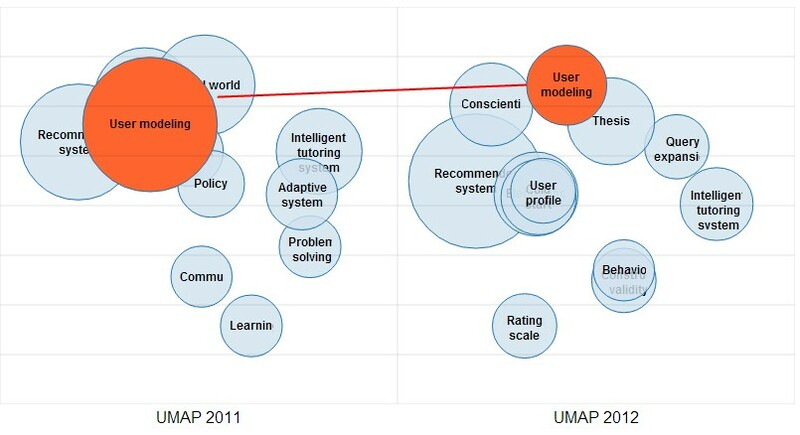 In 2011, “User modeling” is the area with most papers and most bookmarks. It is closely connected to several other larger areas, including “Recommender system”. 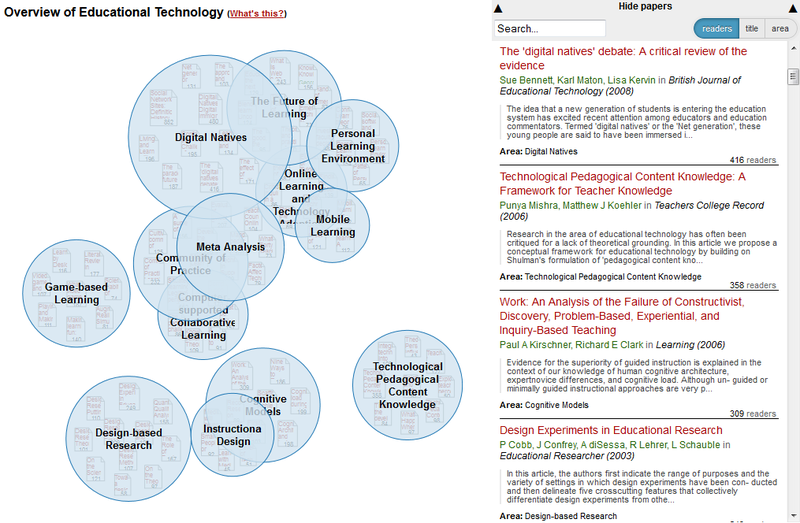 A second cluster of areas can be found on the right hand side of the visualization, involving “Intelligent tutoring system”, “Adaptive system”, and “Problem solving”. The next question was how to visualize the evolution of the conference. As far as time series visualization goes, there are many types of visualizations, most prominently index charts and stacked graphs. In the case of knowledge domain visualizations, simple visualizations are unfortunately not able to convey all necessary dimensions of the data (in terms of ordination, size of research areas and closeness). One possibility would have been to use animation, as shown in the video below with Hans Rosling. In the end, we did not choose to use animation. Why? The reason for that is a psychological phenomenon called change blindness (Simons and Rensink, 2005). It means that people are bad at recognizing change in an object or scence. In the next video, the phenomenon is explained and illustrated with an astonishing example. Animation seems to be especially prone to change blindness; in the video below by Suchow and Alvarez (2011), the colored dots making up the ring are constantly changing. This changing of color seems to stop when the circle itself starts to move – except that it does not. If you concentrate on individual dots, you can see that they keep changing color. Surely, this is an extreme example, but think about it: if Hans Rosling were not to be talking you through the video above, would you have recognized all the changes taking place and would you have been able to interpret them correctly? If you concentrate on one country specifically, could you remember the movement of the other countries as well? Chances are, you would have to watch the animation many times to come up with the same interpretation as Prof. Rosling. All of these considerations led us to choose a different visualization concept popularized by Edward Tufte: small multiples. In small multiples, a graph is drawn for each of the steps in a time series. Then the graphs are positioned next to each other. This approach thus allows for direct visual comparison between different representations. To aid the user in detecting changes between the representations, we introduced two visual helpers. First, a grid is drawn to help with comparing size and position of the research areas. Second, whenever users hover over an area, the corresponding area is highlighted in the other representation, and a line is drawn between the two entities. There are three areas that are present in both years: “User modelling”, “Recommender system” and “Intelligent tutoring system”. While the relative position of the areas to each other has not changed much, the area with the most papers and bookmarks is now “Recommender system”. As you can see from the examples above, this is just a first prototype, albeit a promising one. Using small multiples allows for a comparison of knowledge domain visualizations over various years. Nevertheless, there are certain weaknesses in the current approach: first, the topology of the visualizations is not ideal, as many areas may overlap each other. Second, the usefulness of the method depends on the usage of the system by conference participants. Therefore, we are looking into supplementing bookmarking data with content-based measures when there was lower participation. Third, the continuity between the two years is very low. This could be improved by introducing moving time windows of two years. Finally, it will be important to evaluate the method and the interface. Any comments on the issues mentioned above and the paper in general are of course very welcome! Altmetrics, web-based metrics for measuring research output, have recently received a lot of attention. Started only in 2010, altmetrics have become a phenomenon both in the scientific community and in the publishing world. This year alone, EBSCO acquired PLUM Analytics, Springer included Altmetric info into SpringerLink, and Scopus augmented articles with Mendeley readership statistics. Altmetrics have a lot of potential. They are usually earlier available than citation-based metrics, allowing for an early evaluation of articles. With altmetrics, it also becomes possible to assess the many outcomes of research besides just the paper – meaning data, source code, presentations, blog posts etc. One of the problems with the recent hype surrounding altmetrics, however, is that it leads some people to believe that altmetrics are somehow intrinsically better than citation-based metrics. They are, of course, not. In fact, if we just replace the impact factor with the some aggregate of altmetrics then we have gained nothing. Let me explain why. It refers to the fact that all models are a simplified view of the world. In order to be able to generalize phenomena, we must leave out some of the details. Thus, we can never explain a phenomenon in full with a model, but we might be able to explain the main characteristics of many phenomena that fall in the same category. The models that can do that are the useful ones. The very same can be said about metrics – with the grave addition that metrics have a lot less explanatory power than a model. Metrics might tell you something about the world in a quantified way, but for the how and why we need models and theories. Matters become even worse when we are talking about metrics that are generated in the social world rather than the physical world. Humans are notoriously unreliable and it is hard to pinpoint the motives behind their actions. A paper may be cited for example to confirm or refute a result, or simply to acknowledge it. A paper may be tweeted to showcase good or to condemn bad research. In addtion, all of these measures are susceptible to gaming. According to ImpactStory, an article with just 54 Mendeley readers is already in the 94-99 percentile (thanks to Juan Gorraiz for the example). Getting your paper in the top ranks is therefore easy. And even indicators like downloads or views that go into the hundreds of thousands can probably be easily gamed with a simple script deployed on a couple of university servers around the country. This makes the old citation cartel look pretty labor-intensive, doesn’t it? Don’t get me wrong: I do not think that we can come by without metrics. Science is still growing exponentially, and therefore we cannot rely on qualitative evaluation alone. There are just too many papers published, too many applications for tenure track positions submitted and too many journals and conferences launched each day. In order to address the concerns raised above, however, we need to get away from a single number determining the worth of an article, a publication, or a researcher. One way to do this would be a more sophisticated evaluation system that is based on many different metrics, and that gives context to these metrics. This would require that we work towards getting a better understanding of how and why measures are generated and how they relate to each other. In analogy to the models, we have to find those numbers that give us a good picture of the many facets of a paper – the useful ones. As I have argued before, visualization would be a good way to represent the different dimensions of a paper and its context. Furthermore, the way the metrics are generated must be open and transparent to make gaming of the system more difficult, and to expose the biases that are inherent in humanly created data. Last, and probably most crucial, we, the researchers and the research evaluators must critically review the metrics that are served to us. Altmetrics do not only give us new tools for evaluation, their introduction also presents us with the opportunity to revisit academic evaluation as such – let’s seize this opportunity!